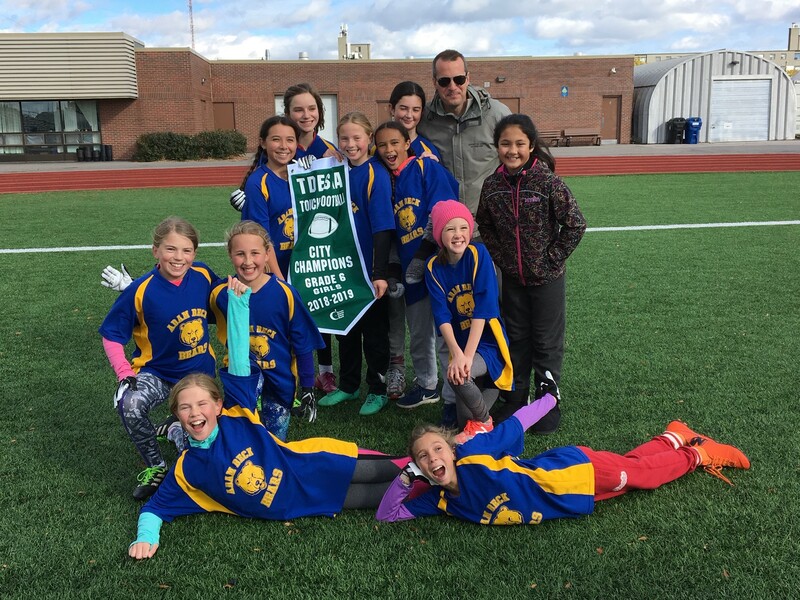 The Adam Beck Public School Bears Grade 6 girls’ touch football team are city champions. The Bears took the Toronto District School Board Athletic Association (TDSAA) title with a 9-6 win over Etobicoke’s Lambton-Kingsway in the championship game played Monday, Oct. 30 at Esther Shiner Stadium in North York. Coach Marc Volpato said wind was a big factor in the championship game, and the Adam Beck girls were able to use it to their advantage in the second half. “We were down 6-0 at the half, the wind was a major factor and at the coin toss we had taken the wind in the second half,” he said. The wind had played a big part in Lambton’s lone touchdown which came close to the end of the first half as they were able to run back a punt that was caught up in the heavy breeze. Lambton, however, did not make the convert. But with that wind at their backs in the second half, the Bears were able to control the ball and do what they had to do to score a touchdown of their own when quarterback Ruby Wood connected with receiver Sophie Malisani to tie the game up. The pair connected again for the two-point convert, and the Bears took an 8-6 lead. They sealed the victory by having Wood punt the ball into the end zone for a one-point rouge on the second last play of the game. Coach Volpato said the Bears defence put in a strong effort throughout the entire championship game, focusing on shutting down key Lambton players. Adam Beck qualified for the city championships by winning their south conference title game 14-6 over Brown Public School. That win earned them a bye into the city championship game, where they would meet west champ Lambton who had earlier beaten north champ Bedford Park to play in the final. Schools in the city’s east conference play flag football, rather than touch football, so they did not have an entry. The girls had a 3-1 record in the regular season, finishing second to Brown. Along with coach Volpato, members of the Adam Beck team are Molly Lye, Melissa Blacquier, Lola Wood, Ruby Wood, Amelia DeMelo, Sophie Malisani, Erica Torres, Zofia Rastorp, Clara Deighan, Camden Smith and Layna Mitchell.